Last week we started our school supply shopping, and I don't know about where you live, but here the children in each grade are assigned a huge list of things to buy and bring on the first day of school. 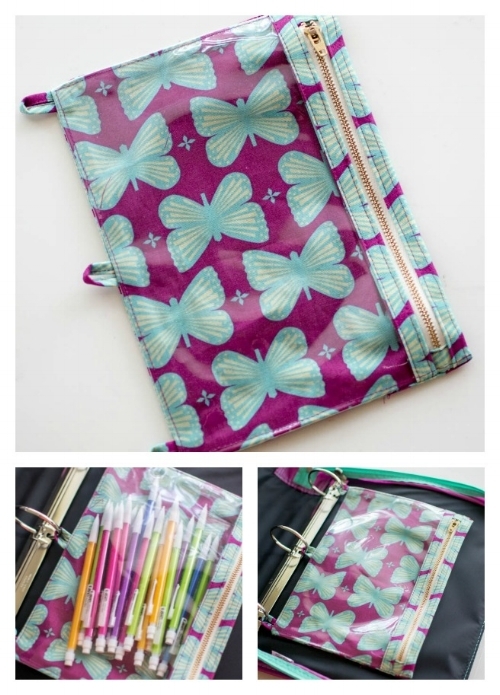 My zipper pouch has a clear vinyl front (you can buy the vinyl at Joanns or cut some from a plastic case like the kind a store-bought bedspread comes in), mostly enclosed seams, an easy, easy zipper, and looks great from both sides. Take your largest piece and fold it in half with the shorter edges together. Press. Next you'll press your 2'' x 10 1/2'' strip just like a piece of bias tape. Fold in half lengthwise, press. Open and fold raw edges to center, press. Then fold down center and press again. Now your zipper tabs. Press the short ends to the wrong side about 1/2''. Then fold in half and press. Press your 1'' x 2 1/2'' loop strips just like tiny bias tape too. This is what all your folded pieces will look like. Step 2. Sewing the pieces together. Now move all the pieces to the sewing machine along with your piece of cut vinyl. You will sew the pieces from the smallest to the largest. Sew the tiny loop strips along the folded edges. Note: I found it easiest to place the strip over one feed dog and move my needle over to reach it. Set these pieces aside when finished. Wrap one zipper tab around the top (open) end of the zipper. Stitch across the folds. Measure 8 1/2'' from the sewn zipper tab and draw a line. Cut off extra zipper tape about 1'' past line (make sure zipper is zipped up). Wrap remaining zipper tab around the end, placing the folded edges just over the line. Stitch second zipper tab in place. Pin the bound vinyl piece right on top of one of the zipper tapes. The strip will go right across the top, centered, over the tabs, and close to, but not touching the zipper teeth. Stitch about 1/4'' from the first row of stitching. Use a zipper foot if you need to. Now pin the folded edge of your largest piece to the opposite zipper tape. Center it opposite the bound vinyl piece. Stitch close to the folded edge, and then topstitch 1/4'' away from that. Open the back half of the large folded piece under the vinyl. Fold the loop strips in half and pin in place over the vinyl along the raw edge. The top and bottom pieces should be 1/2'' from the edge, with the third piece in the middle. Raw edges are aligned. Baste loops in place. Fold the fabric right sides together with the vinyl and loops sandwiched in between. Use only a few pins, and be sure to place them inside the 1/2'' seam allowance. Stitch around three sides (not the side with a zipper) with a 1/2'' seam allowance and leaving a 3'' opening along one short edge for turning. Clip corners and trim away bulky seams. Turn zipper case right side out. It might seem confusing with the vinyl sandwiched in between the fabric... you'll just have to peek on either side of the vinyl and turn on the side where the zipper is right side out. Press CAREFULLY and only on the BACK. Do not touch the vinyl with your iron. Topstitch around three sides (not the zipper side), closing the opening. Done! Now make a whole bunch for all the school kids you know. You might also like my free Christ-centered back to school printable .